The Kyros™ Tablet is a powerful and flexible Internet and Entertainment solution that features a generous 7" screen with intuitive touchscreen controls powered by the Android operating system. 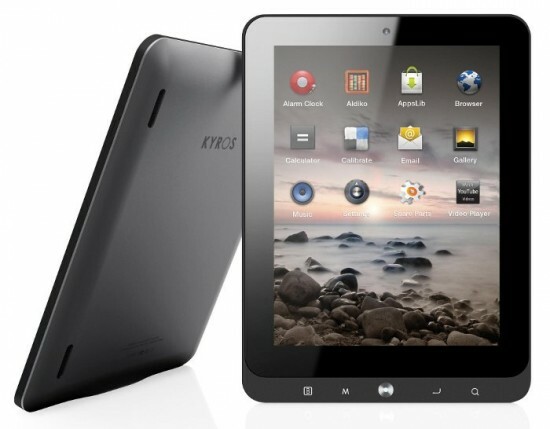 The Kyros™ has 4GB of internal memory and features an SD card slot for upgrading the capacity to up to 32GB. Among the included apps are an alarm clock, browser for surfing the web, calculator, email, gallery for viewing and playing videos. The music and video player lets you enjoy 1080P HD videos, photos, music, and more when connected to your TV via HDMI. To enjoy more out of your Coby Kyros Tablet, you may get your DVD movies ripped and put onto the Coby Kyros for a family road trips or business travel, when wi-fi is not in reach. Below is a quick start guide of how to rip DVD movies off to Coby Kyros Tablet. The guide below uses DVD Ripper Windows screenshots. The way to rip DVD movies to Coby Kyros Tablet on Mac is almost the same. Just make sure you get the right version according to your computer operating system. 1. Add DVD movies to the DVD Ripper. Click the "DVD Disc" icon on the interface to navigate to the videos you want to convert. You can also add ISO file, IFO file or DVD folder. Tip 1: You can click on the dropdown list of "Subtitles" to select subtitles of desired language so that you can view DVD films on Coby Kyros Tablet with proper subtitles. Make sure you select the main movie before setting subtitles. 2. Now choose the output format for playback on your Coby Kyros Tablet. You can get optimized videos for Coby Kyros Tablet under Format > Android > Coby Kyros Video(*.mp4). The output videos could fit on your device perfectly. Tip 2: You can also click "Settings" to change the video encoder, frame rate, resolution, etc. 3. Start the DVD to Coby Kyros Tablet Conversion. Click "Convert" to let the software do the DVD to Coby Kyros Tablet MP4 conversion. After the ripping, you can click "Open" to locate the converted MP4 video files and just transfer them to your Coby Kyros Tablet. Step-by-step transferring videos and music to Coby Kyros Tablet. 1. Turn on your Coby Kyros tablet. 2. Take the included usb cable and connect it to both your tablet and your computer. 3. Look closely at the top bar on your Coby tablet. There should now be one or two small usb symbols in the upper left corner of the tablet screen. Place a finger tip or stylus onto the usb symbol, and holding it there, drag it downward across the screen - this will pull open another window. 4. On the pull down screen, there will be two options, usb connected (internal) and usb connected (external). External is for moving files between your computer and your tablet's sd card. 5. Click onto usb connected (internal), you will be asked if you want to mount the device - click "mount". 6. On your computer you will see a box which reads "removable disk”. Select "open folder". 7. Now drag and drop whatever files you want to from your computer into the now open tablet box. You can even move file folders full of music or videos, or whatever. And just like on your computer, you can create and name new files in the open tablet box to move your content into. It's as easy as drag and drop, or you can copy and paste as well. 8. When you have moved your files onto the open tablet box on your desktop, return to your coby Kyros tablet screen and select "turn off usb storage". Now click turn off and unplug your usb cable.